This editorial reviews the international lineage and also the ramifications of the decision by the United Kingdom Supreme Court in Montgomery v Lanarkshire Health Board  1 AC 14;  UKSC 11 in respect of medical practitioners’ obligations to advise of risks to their patients. It argues that the abandonment of the test set out in Bolam v Friern Hospital Management Committee  1 WLR 582 constitutes the final interment of the paternalistic rationales for withholding pertinent information from patients. The decision is internationally significant in terms of its recalibration of the doctor-patient relationship, its identification of the dignity in informed decision-making by patients, and its assertion of a culture of shared information to enable patients to balance clinical with non-clinical considerations in making decisions about treatment. The Medical Panels as constituted under Victorian workers’ compensation legislation and the Wrongs Act 1958 (Vic) are a unique entity. They are deemed to be a tribunal for the purposes of the Administrative Law Act 1978 (Vic) and have evolved through a series of legislative amendments from providing advice on medical issues to the decision-making arms of the Victorian Workcover Authority to occupying an important role in dispute resolution. As such, Medical Panels provide opinions and determinations which are binding on all parties and the courts and which are subject only to judicial review by the Victorian Supreme Court. There is no merits review of Panel decisions. The nature of appeals brought against Panel decisions are considered here, including the impact the successful appeals have had on the policies and procedures adopted by the Medical Panels. Whether the use of panels of expert medical practitioners might prove advantageous in other jurisdictions is also considered. In the 2016 appeal Health Care Complaints Commission v Schmidt  NSWCATOD 145, the New South Wales Civil and Administrative Tribunal heard evidence to the effect that the influence of alcohol (alertness, judgment and co-ordination) could occur at blood alcohol concentrations as low as 0.01% and that on-call health professionals should not consume any alcohol. The NSW Health Code of Conduct requires all staff, including contractors, “not to be under the influence of alcohol or drugs when commencing work and while at work”, and the Public Health Regulation 2012 (NSW) similarly requires that “health practitioners must not practise while suffering from a physical or mental impairment … that detrimentally affects, or is likely to detrimentally affect, his or her ability to practise or that places clients at risk of harm”. If this were to be accepted as a professional standard for on-call medical practitioners, then it would have major implications for much of the medical profession, particularly those on continuous call in private practice whose hours are not delimited. The evidence for alcohol-induced impairment of clinical performance is assessed here through the prism of the cognitive and psychomotor skills requirements for surgeons. On 10 October 2016 the Essendon Football Club (EFC) performance-enhancing drugs regulatory saga concluded with the Swiss Federal Tribunal deciding not to “entertain” EFC’s appeal of the Court of Arbitration of Sport’s (CAS) guilty finding, thus supporting the World Anti-Doping Authority (WADA). The appeal is a unique decision as it is the first time a team (34 players from the one team) has been subject to CAS’s jurisdiction for allegations of doping contrary to the World Anti-Doping Code. One significant concern throughout this regulatory saga was that the team-based nature of the infraction denied individual players natural justice. Central to these concerns is the fact that the players were advised by EFC to take part in the program and that its chief architect, sports scientist Stephen Dank, never gave sworn evidence that could be tested in cross-examination. This column investigates whether there are important lessons for team-based anti-doping infractions from the EFC saga. The introduction of a mandatory duty to report health practitioners who engage in notifiable conduct has heightened concerns about the potential for notifications to be motivated by rivalry or spite, rather than genuine concern for patient safety. The research discussed in this article explores the views and experiences of health sector professionals in Australia regarding vexatious and misconceived notifications by doctors against other doctors. Interviewees believed most mandatory reports are made on strong grounds with sound motives. Under-reporting was seen as a more significant problem than over-reporting. Three types of inappropriate reports are identified: misconceived reports resulting from a misunderstanding of the reporting thresholds; vexatious reports made with the intention of causing trouble for another practitioner; and avoidable reports where the threshold for reporting need not have been reached if colleagues or employers provided early appropriate support. In light of recent mandatory reporting laws, this article offers recommendations that may assist in supporting appropriate reports and reducing the number of inappropriate reports. Increasingly, the health and wellbeing of professionals is causing concern, particularly when it compromises the interests of those they serve. Often their health issues are reported when their conduct results in professional disciplinary action. In New Zealand, health practitioners who appeared before the Health Practitioners Disciplinary Tribunal for misconduct reported a range of physical and mental health conditions. This study of 288 decisions revealed the professions that reported diverse health issues, including categories of health issues, in published decisions between 2004 and 2014. The study also identified how frequently practitioners self-reported impairment or submitted health evidence from others of their physical and/or mental health status and/or their substance dependence. The study’s findings may be applied preventatively for the benefit of practitioners and the people they serve, thereby promoting the Health Practitioners Competence Assurance Act 2003 (NZ)’s emphasis on public safety. This article examines the first power that Victorian parliamentarians granted to the Medical Board of Victoria (Board) to regulate impaired doctors. Convinced that substance-addicted doctors were a “menace”, in 1933 the legislature gave the Board discretion to remove their names from its register of “legally qualified medical practitioners”. In the next 15 years, however, the Board chose not to cancel the registration of several doctors who came to its attention for their addiction to alcohol or drugs and instead the Board monitored those doctors; it mostly sought assurances from the practitioners that they were obtaining treatment for their addiction, abstaining from consuming alcohol and drugs, and refraining from practising medicine, usually until their treating practitioners considered that they were fit to resume medical practice. This article evaluates the benefits and pitfalls of the Board’s regulation of these doctors, including in light of Anglo-American legal scholars’ discussion at that time about the merits of the growth of administrative agencies and their work. The article then considers the lessons that can be learnt from this history about how substance-dependent doctors should be regulated and who should be involved in decision-making regarding their regulation. Paramedics provide emergency and community health services to diagnose, treat, transport and provide advice to patients. However, current regulatory structures do not adequately protect the public from the potential for paramedics to cause harm to their patients. Paramedic employers regulate the paramedic industry rather than the National Registration and Accreditation Scheme used for other equivalent registered health practitioners in Australia. A number of coronial inquests have considered the conduct of paramedics and highlight the challenges of the current paramedic regulation in protecting the public from risk. Expert witnesses act as “injury brokers” in contributing to the analysis of what qualifies as legally recognised and compensable injury in medical negligence litigation. The orthodox approach in Australia is that expert witnesses, like advocates, are immune from suit in negligence. In Attwells v Jackson Lalic Lawyers Pty Ltd (2016) 90 ALJR 572;  HCA 16, the High Court of Australia upheld, but narrowed, advocates’ immunity. This article outlines the decision in the Atwells case and after reviewing Australian authority on expert witness immunity argues that, given the recent narrowing of the scope of advocates’ immunity, similar limitations are likely to be placed on the scope of expert witness immunity with two effects – it will be less commonly available and less predictably available. Australia’s health system is characterised by an ongoing tension between a commitment to utility and a commitment to individual rights. This tension is particularly problematic for the Australian Government when deciding which cancer medicines to add to the Pharmaceutical Benefits Scheme in order to make them cheaper for patients. This article investigates how the right to the highest attainable standard of health has influenced decisions about funding high-cost cancer medicines in Australia. It considers the value of the right to health for funders and concludes that resource allocation decisions should not be entirely informed by the right to health. It is maintained that, instead, regard should be had to the cost-effectiveness and affordability of cancer treatments before they are subsidised. National registration of Australian health practitioners aimed to facilitate workforce mobility. Non-medical prescribers, including nurses, podiatrists and optometrists, are overseen by National Boards which, in some cases, specify a formulary from which their health practitioners may prescribe. All prescribers must comply with their respective State or Territory’s legislation. If prescribing a medicine that is a benefit under the Pharmaceutical Benefits Scheme (PBS), additional restrictions may apply. National Board and PBS prescribing formularies were compared and State and Territory medicines legislation was interrogated regarding non-medical prescribing. Discrepancies were identified between the approved formularies for non-medical prescribers, PBS prescribing formularies and medicines allowed to be prescribed under jurisdictional legislation. Asynchronous medicines legislation provides potential for health professionals to either inadvertently or knowingly breach legislation following national changes to health policy. Consideration should be given to the development of consistent legislation and its uniform commencement across all Australian jurisdictions. Since their widespread introduction in the early 20th century, vaccinations have saved millions of lives worldwide and have near to eradicated some diseases in several countries. Vaccination in Australia, although not mandatory, is strongly and actively encouraged through pervasive education campaigns, financial incentives and administrative requirements. Despite this, approximately 10% of children in Australia are not fully vaccinated against vaccine preventable diseases and every year thousands of Australians are infected with one of these diseases. This article considers the liability in negligence of parents whose unvaccinated children infect and cause harm to others. It argues that policy considerations will ultimately determine decisions about liability in a given case and, in particular, that courts should take into account the reasons for failure to vaccinate in making their determination on liability. The article further argues that if reasons for failure to vaccinate are not regarded as appropriate matters of differentiation for the purposes of tort law, all unreasonable non-vaccinators should nonetheless be liable for physical harm that their failure to vaccinate causes. Although the abilities to understand and to evidence a choice are universally recognised as necessary for decision-making capacity (DMC), they are not sufficient for DMC. Additional criteria such as “appreciation”, “reasoning”, and “using or weighing information” are often used, but the broad and under-defined nature of some of these additional legal criteria has resulted in diverse and sometimes inconsistent interpretations. This article canvasses jurisdictional variations in DMC criteria, focusing on common law and statutory tests in the United States, the United Kingdom and Canada. It proposes a more integrated framework for interpreting DMC beyond the understanding and evidencing a choice criterion by describing how, in addition to the familiar criterion of the ability to form adequate beliefs, “the ability to value” criterion can usefully fill that space. The article illustrates the potential usefulness of this framework by reviewing how the ability to form adequate beliefs and the ability to value are relevant in several challenging cases drawn from the legal literature and clinical experience. Providing medical assistance to an injured, unrelated third party is an act often viewed positively by society. A tension in tort law that has arisen in most jurisdictions is whether such a duty should be imposed on certain classes of individuals or on society as a whole. 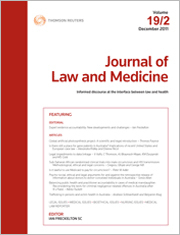 In Australia this issue has arisen in cases such as Lowns v Woods  Aust Torts Reports 81-376 and Dekker v Medical Board of Australia  WASCA 216, which have posed the question as to whether there is a legally enforceable duty for medical practitioners to render such assistance in certain circumstances. This article examines the current position of the Australian law on whether a duty to rescue exists generally, or in regards to medical practitioners specifically. A review and comparison of the Australian position with respect to other common law and civil jurisdictions is also undertaken. The judgment by the Supreme Court of Appeal of South Africa in South African Dental Association v Minister of Health  ZASCA 163 concerns a seemingly technical question about the statutory professional recognition of dental assistants, and therefore provides an opportunity for a legal-historical analysis of how a health/medical profession is “made”. The primary locus of this article is South Africa. However, the value of the analysis is not confined to jurisdictional boundaries, as the reader is invited to reconsider how and when a vocation or occupation becomes a profession. The underlying question of professionalisation, incidental to the Supreme Court of Appeal’s reasoning, informs and guides an important debate with relevance not only for the parties before the Court, but also for the contemporary notion of professional practice. It is argued that the power of professionalisation deserves to be demystified in order to make legal sense and to affect legitimacy and trust in the eyes of the public at large. The 2014 West African Ebola outbreak constituted a social and economic development challenge, at the core of which was the enduring and unresolved problem of global access to medicines. The Ebola outbreak provided strong evidence of the world’s unpreparedness for the socio-economic challenges of a large-scale pandemic and served as a poignant reminder that using intellectual property regulations to perpetrate a formidable access to medicines’ regime can put global public health in serious jeopardy. This article highlights the connection between the access to medicines conundrum and the right to development against the backdrop of the 2014 West African Ebola outbreak. It argues that diseases ravaging populations in developing countries has a ricochet effect on global public health as well as global security, and as such there is a need for more international co-operation in stemming the tide of such pandemics. For the PDF version of the table of contents, click here: JLM Vol 24 No 3 Contents.